Artists Brandi Roberts and Inaki Aliste Lizarralde draw the floor plans of TV homes. For example Eddie Monsoon’s townhouse from Absolutely Fabulous; the Golden Girls’ Miami bungalow, Frasier’s Seattle apartment , the NYC apartments from SATC, Friends and the Big Bang Theory and the offices of Stirling Cooper Draper Pryce. 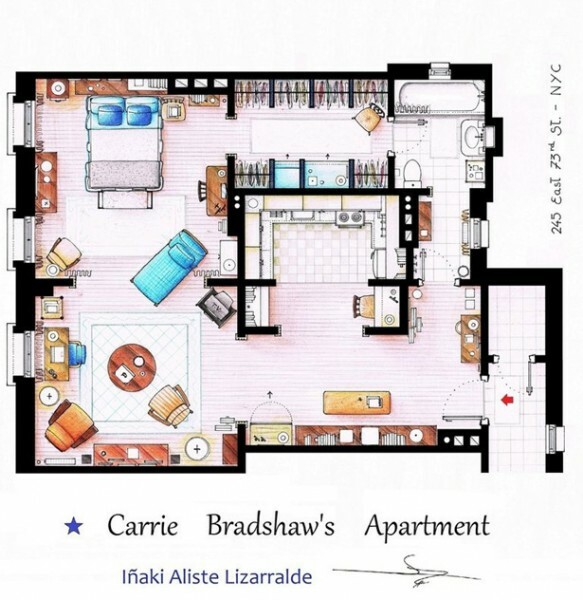 “Fantasy Floor plans was born out of my love of drawing, pop culture and TV. My hand-drawn floor plans merge Pop Art with celebrity to make art that doesn’t just entertain, but captures the evolution of the American TV home over the last seven decades”. I hear her! 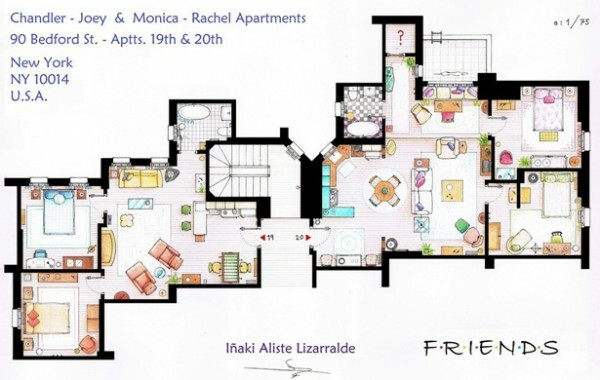 Many times have I tried to imagine the lay-out of Monica and Rachel’s great flat. or the lush place of Frasier in the show of the same name. Or come to think of it, the bungalow of the Golden Girls…. I even considered drawing them out myself on more than one occasion. But as much as I love this idea, I immediately noticed some errors. I know I know, jealous much? But may I?